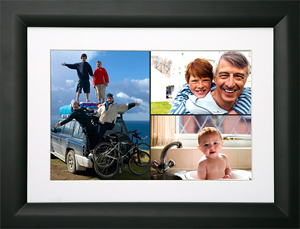 Deemed this year's perfect holiday gift, digital frames come in a variety of shapes, sizes and feature sets. Here's some advice if they're on your shopping list. Yes, folks, we've found the perfect holiday gift. Hand it to a loved one empty, and it's a place for that person to show off his shutterbug skills. Fill it with family memories, and you've suddenly surpassed your siblings to become Mom's favorite. It says, I care, I'm sentimental, and I know how to decipher the specs of a digital photo frame. Choosing a photo frame is easy. But throw the word digital into the mix, and you've got yourself a project. Start by choosing a size. While the size of a printed photo typically dictates the size of the frame you'd choose, a digital frame can adapt to any imageso it's mainly about how much actual space you'd like your images to occupy. Frames come in all shapes and sizes, from keychain units on up. Next, look at the unit's resolution. Just like with TVs, resolution will determine the quality of the image being projected. As you enlarge a picture, the image quality will decrease because the pixels are spreading. The higher the number, the better, especially if you have a larger screen. Click here to read more and view slideshow of different models. Great idea to make use of a smaller TV!